Charles F. Mann is a printmaking artist who carves woodblocks and linoleum to make limited-edition, fine art, hand-pulled prints. It is the traditional Western-style of relief printmaking using oil-based inks on archival 100% cotton rag paper. His award-winning work has been shown in several exhibitions in the Dallas metroplex and North Texas area. And, it is found in private collections around the United States. Charles comes from a technical background in engineering and science with degrees from Texas A&M University and Southern Methodist University. 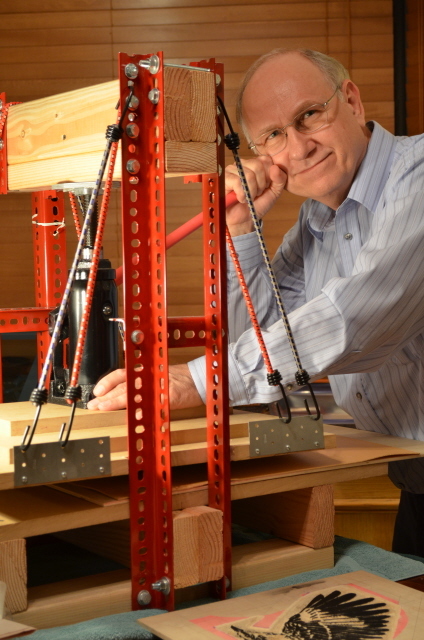 He holds several patents on his inventions. His art is largely self taught via reading and experimentation over many years until he finally perfected his technique. His art training came from his mother and great grandfather. His mother was an elementary school art teacher in the public schools. She introduced him to linocuts in elementary school. His great grandfather, who was a sculptor formally trained in Vienna, taught him to whittle and sharpen pocket knives. From that influence, Charles went on to carve numerous small, wooden objects leading to larger pieces such as chests and rocking horses for his children and grandchildren. This also instilled an interest in wood relief carving and printmaking from carved wood blocks in the traditional Western methods that use a press to apply oil-based inks on 100% cotton rag paper. Growing up, Charles’ early prints were both wood blocks and linocuts. He tried out various tools and carving materials, and worked with inks from water-based to oils. Experimental pieces were usually wood blocks and small linocuts. As a fifth-generation Texan, he lives and works in the Dallas area.